For those who’ve been reading for awhile, you’ve probably surmised that one of my personal health interests is seasonal and pandemic flu. There were plenty of stories about that this week, so that’s what we’ll focus on. We’ll also look at Ebola and other stories you may have missed. My apologies for posting delays this week, I’m dealing with some rotator cuff and carpal tunnel issues in my right arm, and let me tell you, it is HARD to type with your dominant arm in a sling! Enjoy your holiday Monday (if you have one) and have a safe and healthy week! 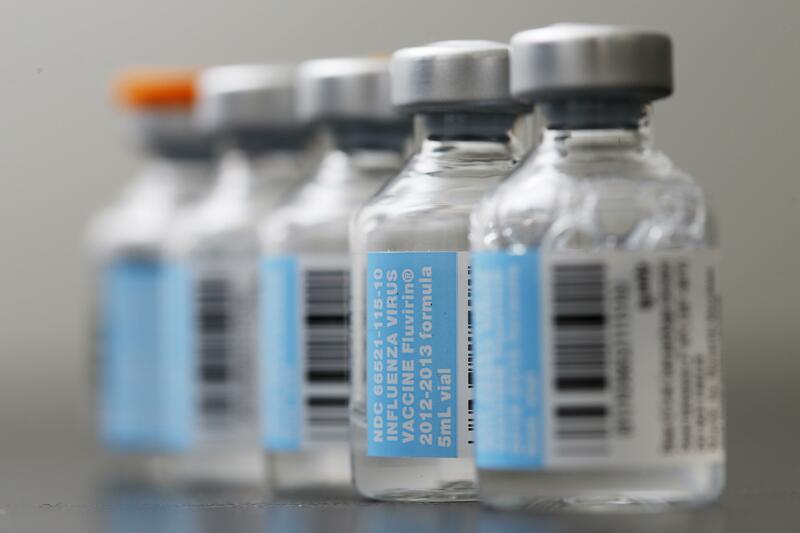 The CDC has said that this year’s seasonal flu vaccine was only 23% effective due to unanticipated antigenic drift—meaning the predicted strains in the vaccine didn’t match the dominant strains of the virus that are currently circulating. In order to combat this in the future, scientists at Mount Sinai health system in New York are in the process of testing a universal flu vaccine which will go into clinical trials this year. Scientists at Washington State University in Spokane have found a brain protein that boosts the healing power of sleep and speeds recovery from the flu in mice. Professor James M. Kruger said this discovery could lead to alternative treatments for flu and other infectious diseases by stimulating production of the brain protein called AcPb. This discovery comes at a time where avian influenza is prevalent in Taiwan, Japan, Nigeria, China, Egypt, Canada, the U.S. and Mexico. Washington State University—“Krueger showed this recovery involves AcPb and an immune system signaling chemical called interleukin-1. AcPb links up with interleukin-1 to help regulate sleep in healthy animals. It also prompts infected animals to spend more time sleeping during an illness. As GMU students return to classes, so do students in Ebola affected Guinea. Schools in Guinea will re-open Monday, and schools in Liberia are set to re-open “next month.” No date has been set for schools in Sierra Leone. Despite this, the President of Sierra Leone has declared that there will be zero new confirmed Ebola cases by the end of March the country will be Ebola-free, by WHO standards, by May. These announcements come at a time when Dr. Thomas Frieden, Director of the CDC, has said he was “very confident we can get to zero cases in this epidemic if we continue the way we’re going and nothing unexpected happens” and the outbreak appears to be slowing down. Last week brought record low numbers—for Guinea, the lowest total since mid-August; for Liberia, the lowest total since the first week of June; for Sierra Leone the second week of declines and the lowest level since the end of August. However, there are still “at least 50 micro-outbreaks” underway throughout West Africa. A seemingly large amount of good news this week left space for new ruminations on Ebola and outbreaks in general. Wired had an interesting piece on Nanobiophysics and how it could stop future global pandemics while The Chicago Tribune looked at bats and their likely role in Ebola outbreaks and CNBC looked at the price of protection from global pandemics—would you believe $343.7 billion? Last week we learned about dirt as a potential source for new antibiotics. This week, there were stories about new antibiotics coming from arctic waters. How useful would a device that sniffs out chemical weapons be? Potentially very useful for those workers tasked with cleaning up mustard gas and lewisite, says an article in New Scientist. Computer modeling by researchers at MIT, Draper Laboratory, and Ascel Bio could forecast reaction to disease outbreak. This model looks at reactions through news reporting and social media in collaboration with hospital records of actual disease incidence. Did you see that the destruction of Syria’s most lethal chemicals is now complete? Well, it is! Its good news among so many biodefense stories covering Ebola. I have no interest in making the Pandora Report the “All Ebola, All the Time” newsletter. As such, we will look at one Ebola story as well as stories covering new discoveries in tuberculosis and influenza. Have a fabulous weekend, and students, enjoy your last one before classes start on Monday! A recent study published in Nature reports that tuberculosis originated less than 6,000 years ago and was carried to the new world by seals. Seals! This new research contradicts original timeline and species genesis and some scientists think this study provides more questions than answers. As the fall season and semester approach, the flu season travels with it. I was delighted to read that Walgreens, in addition to CVS, will now offer seasonal flu shots in their stores. More interesting news about flu came out of Vanderbilt University, too. Researches have investigated enzyme phospholipase D (PLD) and it ability to help the influenza virus escape immune response. Blocking PLD could assist in preventing the flu. Internationally, the good news is that quarantines have been set up in Liberia, in attempt to contain the spread of Ebola. The bad news is that they have become fairly violent. Stateside, this week Dr. Kent Brantly and Nancy Writebol were released from Emory University Hospital after recovering from Ebola infections acquired in West Africa. Image of the Week: Influenza! 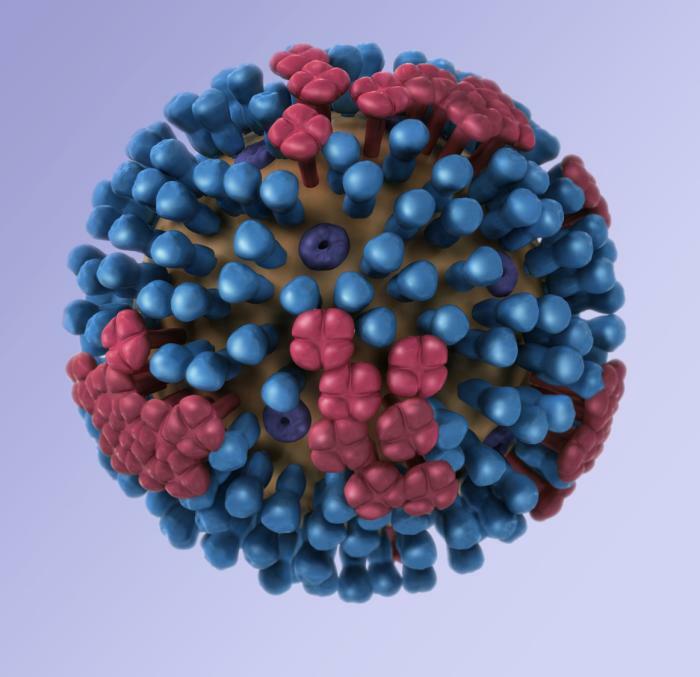 This illustration provides a 3D graphical representation of a generic influenza virion’s ultrastructure, and is not specific to a seasonal, avian or 2009 H1N1 virus. There are three types of influenza viruses: A, B and C. Human influenza A and B viruses cause seasonal epidemics of disease almost every winter in the United States. The emergence of a new and very different influenza virus to infect people can cause an influenza pandemic. Influenza type C infections cause a mild respiratory illness and are not thought to cause epidemics. Influenza A viruses are divided into subtypes based on two proteins on the surface of the virus: the hemagglutinin (H), and the neuraminidase (N). There are 16 different hemagglutinin subtypes and 9 different neuraminidase subtypes. Influenza A viruses can be further broken down into different strains. Current subtypes of influenza A viruses found in people are influenza A (H1N1) and influenza A (H3N2) viruses. In the spring of 2009, a new influenza A (H1N1) virus emerged to cause illness in people. This virus was very different from regular human influenza A (H1N1) viruses and the new virus has caused an influenza pandemic. Influenza B viruses are not divided into subtypes, however, influenza B viruses also can be further broken down into different strains.